Corner lot at Abbott and Voltaire has been sold. Editor: There are changes afoot in north-west OB, particularly at the corner of Abbott and Voltaire. Here is Matthew Wood’s latest report. The long-vacant lot at the southeast corner of Voltaire and Abbott Streets has just been recently sold, which may spark a domino effect of land sales on that corner. Ray Adams, of Cassidy Turley Commercial Real Estate, confirmed the two lots had been sold for $635,000. 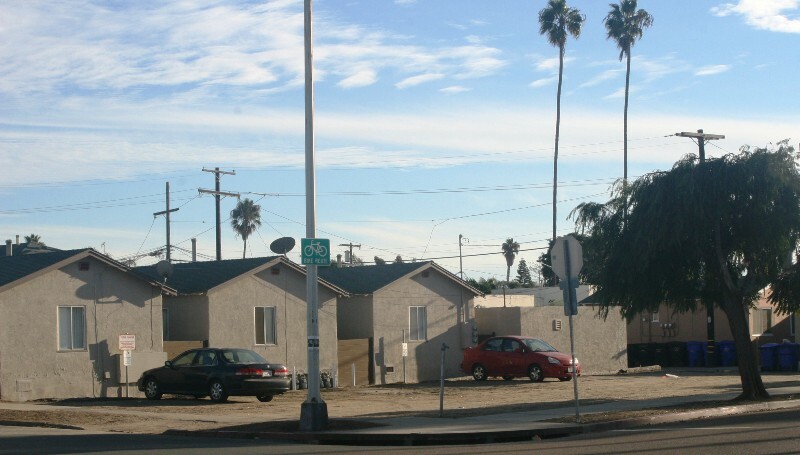 The lots are 2,500 square feet each – 5,000 square feet total – and are zoned for residential housing. The Keen Family Trust was the seller. He said the lots could probably be used for a maximum of three units. “You probably can’t build any more there,” he said. Adams also confirmed the cottages adjacent to and east of the empty lot that was just sold were on the market, property also owned by the Keen Family Trust. The asking price for the four lots – with seven cottages and five garages – is $1.6 million. The cottages are in a gated or fenced complex, which currently has a “For Rent” sign outside asking for $1,200 a month for one of the units. Directly across Voltaire from the vacant lot is Pat’s Liquor. And the OB Rag has confirmed that the property is also for sale. Dan Ryan, of Coldwell Bank, said the 10,000 square feet of land from the corner to the alley is on the market for $1.545 million. 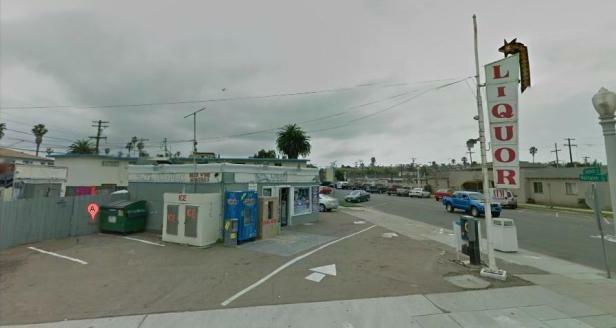 That land includes the old market, a fixture in the neighborhood for at least the past 50 years at 5096 Voltaire Street. “He’s asking a lot for it and nobody’s making an offer,” said store owner Basil Zetouna referring to the property owner. Ryan said he has talked to people who would like to see something different at that location. Zetouna also owns Abbott Street Market just down the block at 2074 Abbott St., as well as the building, and said he has no plans to close that store. He said his dream would be to one day move into the space above the store. The corner of Voltaire and Abbott – showing Pat’s Liquor at northeast end and the vacant lot – now sold – on the southeast side, with 7 cottages next door up for sale. Interesting re: the vacant lot selling separate of the cottages, especially since it’s been off-street parking for them for so long. I was wondering that myself – where will they park now? There are 5 garages included off the alley. By law, there would have to be 7 off-street spaces at the Voltaire cottages – my suspicion is that the garages are rented separately (as the 8 garages are at my mother-in-law’s 10 unit, 14 bedroom complex on Cape May with no other off-street options) and thus can’t be counted as resident parking. When I lived on the other side of town it wasn’t uncommon to park 1/4 mile or more from my apartment if I got off work late. 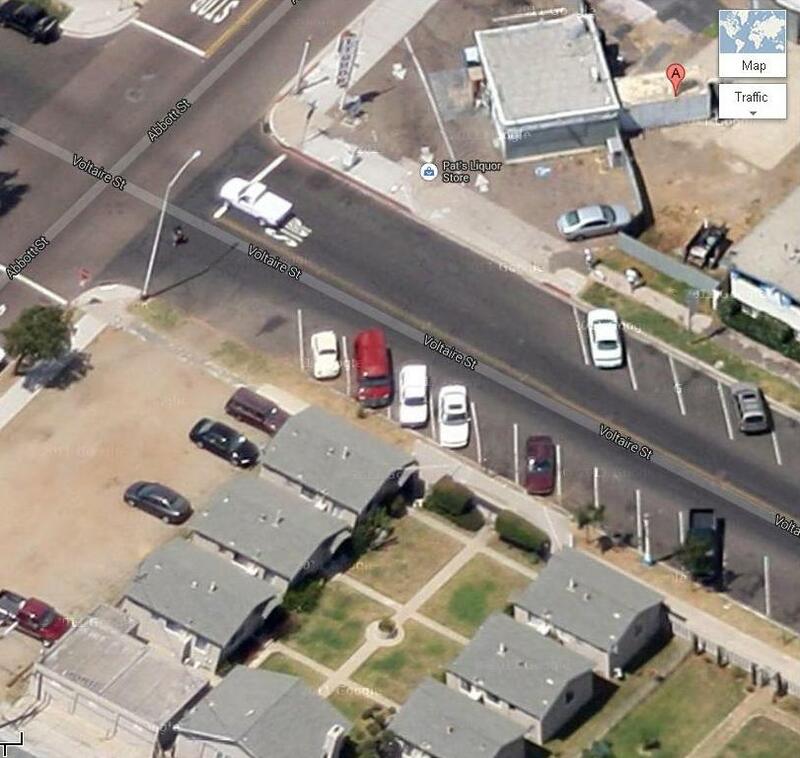 Assuming that most people in San Diego rely on cars for transport, and that 3 of the cottages are single occupancy and 4 are shared by couples (which I don’t think would be a stretch), loss of that lot could put 11 or more cars on the already overcrowded streets of the war zone. Dave – thanks for the heads-up. I should add to clarify that “legal” is as of today’s zoning laws – I have no idea when my house was split into two apartments and the backyard was turned into a four-plex, or what parking laws were like then. Lots of the units down here, especially places like mine where extra units have been added in what used to be backyards, are likely grandfathered out of having to comply. FYI…more changes on the corner of Voltaire and Catalina. 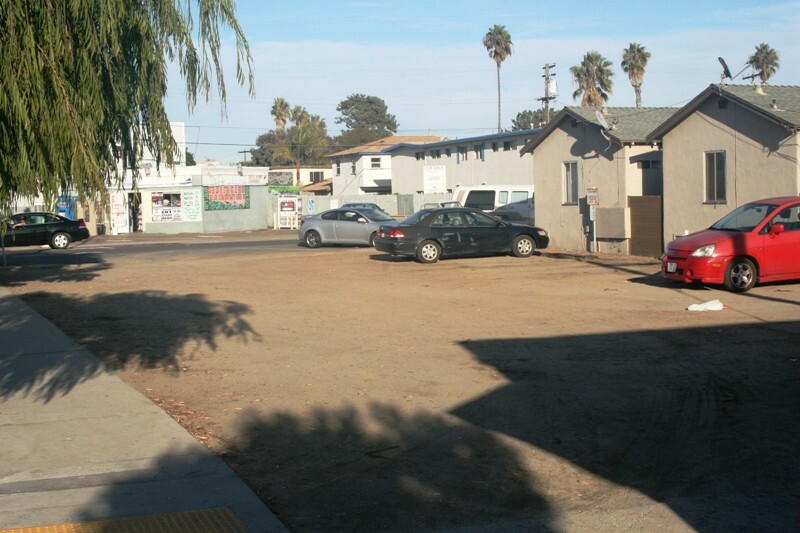 (vacant lot across from 7/11)….construction going on now. Have a good day everybody! I saw that. I wonder what’s going in? Debbie – thanks for the link to the construction at Catalina and Voltaire. It’s condos and retail along the Voltaire side. My neighbors and I are are so happy our landlord raised our rents right before the construction began. So joyous to pay extra for the sounds of never-ending backup alarms and dirt everywhere. My Mom lived in that court in the photos, and the rent was only a couple hundred bucks. I imagine some us can remember rents of less then 100 dollars a month. Poor people could actually afford to make a life. I think If the Pat’s Liquor property sells we may loose the right to commercial use at that corner, it appears to be zoned RM2 , medium density residential. Now is the time to change the zoning to CC4-2 during the update of our local community plan. CC4-2 would allow residential, commercial or mixed use. If Pat’s goes, I’d rather see property go low density residential. Commercial use is an inappropriate throwback at that end of the block. I don’t see a problem with having a single c-store every few blocks in residential areas. 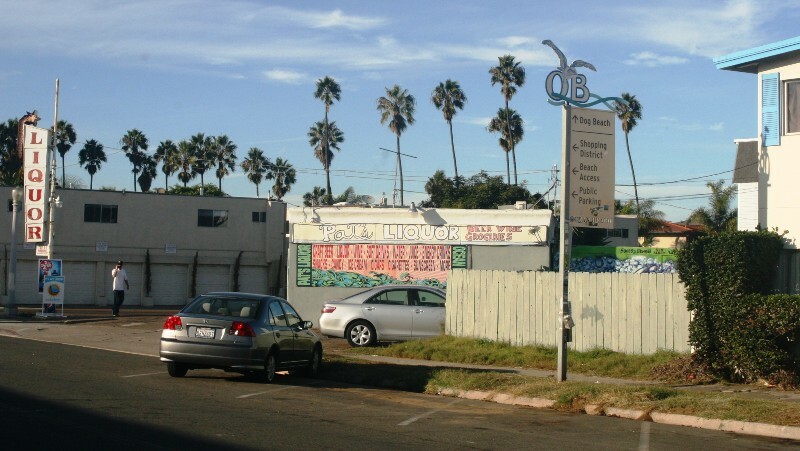 And aside from Pat’s, on the other side of the vacant lot on Abbot is a small strip mall with a laundromat (used to be a surf shop too – Rocky’s? ), then across the street from that is Newbreak Pizza, a block and a half past that is the Abbott Market – so there is some established precedent for low-profile commercial along Abbott. Yes, Rockys was in that strip mall. but don’t you mean Surfrider Pizza, not Newbreak?? Newbreak is across from main lifeguard tower on Abbott and is not a pizza place. Yes, you’re right OB Mercy; it’s Surfrider Pizza – damn good too! They also advertise here. I think the laundromat, Surfrider & Abbot St market are all on RM_2 lots, not zoned for commercial use either. I think these existing sites should be protected by re-zoning to cc4-2 and allow services to residents to continue regardless of ownership. Mixed use is best use in this instance. Older Article: Save the Turkeys!